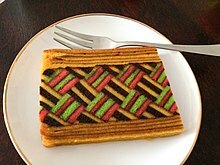 Lapis legit (Dutch: spekkoek) is a spice-flavored multilayered cake. A legacy of Dutch occupation in Indonesia, the cake is enjoyed during Eid ul-Fitr and Christmas celebrations. In the Netherlands, the sliced cake is served as dessert in Rijsttafel (Indonesian rice table). The cake has a firm texture similar to baumkuchen, but without a chocolate or sugar shell. The cake requires much patience to bake. Each layer of the cake is made by pouring a small amount of batter from a cup into the baking tin, then putting the tin into the oven until the layer has become golden from the heat. The tin is then removed from the oven and the process is repeated until all the layers have been built up. Baking the cake in a gas oven gives a better aroma than using an electric oven, but a Dutch oven with a charcoal fire on top of the lid produces the best result. If clove buds or cardamom seeds are difficult to find, use spekkoek powder as a replacement. Milling and mixing the spices before baking produces a cake with an excellent aroma. Mix and sift spice ingredients. Beat egg yolks with castor sugar until fluffy. Beat egg whites in separate mixing bowl until fluffy, then mix with egg yolks. Mix the spices, condensed milk, flour, and butter. Using a small cup, pour 30-35 cc batter into baking pan to make a layer. Bake in preheated 350°F oven, heat from top, until golden (4-5 minutes). Remove from oven, paint butter for flavoring, and pour 30-35 cc batter to make another layer. Repeat to make around 30-40 layers. Adding to the complexity of the baking process, some cake shops add dried plums (prunes) inside and on top of the cake. This page was last edited on 28 November 2014, at 21:10.